Jumia Egypt is the number one online website in Egypt which sells all categories of products and devices that you could think of. At Jumia Egypt, you can find anything you need for your home, yourself, your office or even your children. Starting from 15th of July until 29th of July, we are proud to present you with the biggest deals ever made at Jumia Egypt. If you’re shopping for fashion and clothes, you can find women clothes, men clothes and even kids clothes for girls and boys. If you’re shopping for your home, you can find many different appliances such as large and small ones which can include kitchen appliances such as refrigerator, freezer, microwave or oven. It can also include bedroom furniture and living room furniture. How about some outdoor essentials or storage units? Basically, anything you might need for your everyday life, you can find it here. 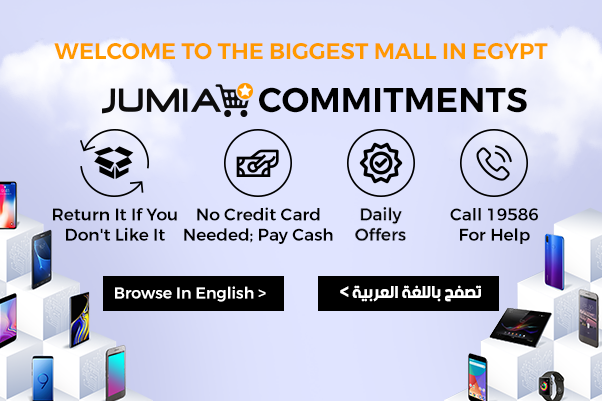 All products available at Jumia Egypt are carefully picked out to make sure we offer our customers the best quality and most affordable prices in Egypt. If you’re looking to buy a new mobile phone, get the best and latest releases from world famous brands. Any device or electronics such as MP3 players, tablets and headphones are also found at our online store. Electronics, Appliances, Fashion and More! Jumia online shopping offers you home appliances, electronic devices, personal care products for men, women and even babies, and so much more. Start exploring and shopping today and get a safe and easy online shopping experience only at Jumia Egypt. Shop today to enjoy endless deals and discounts before it sells out.